Nick Church and Florence Barrow hope to set off across the Channel in Laser later this year to help raise funds for the Alice Martineau Trust. Church brings us up to date with the plans? It was during the course of the summer forgone that the idea to sail across the English Channel in Laser 1s was initiated. During the course of this summer (8-13 August), Florence Barrow and I will be undertaking a trans-Channel crossing in Laser 1s. We believe that we will be the first and youngest Laser team to attempt this. The 21-mile journey (which should take a minimum of five hours providing we average 4 knots) will start on Shakespeare Beach in Dover and is headed for Cap Griz Nez, Calais. We will be accompanied by the Pilot and Channel Swimming Federation for the provision of the necessary safety cover. It is an exciting challenge which appeals not only to a love of sailing, but also to the possibility of raising money for three specific charities, each of which bears some personal significance. The first and main charity is RYA Sailability, the second is the Alice Martineau Trust and the third is the Community of St John’s work with street children in Lithuania. The main charity, RYA Sailability, is concerned with enabling mentally and physically disabled people to experience the freedom and exhilaration of sailing. Sailing is one of the very few sports in which able-bodied and disabled people can participate on equal terms. From a personal love of sailing we share emphatically in an understanding of what it must mean to those without sight, hearing or an ability to manoeuvre to feel the joy of riding the water. RYA Sailability encourages people with disabilities to take up the sport and facilitates sites to develop sailing opportunities. The Alice Martineau Trust was set up in order to help patients with Cystic Fibrosis. It is closely linked to Florence and her family as they knew Alice. Cystic Fibrosis is as yet incurable, and is the UK’s most common life threatening inherited disease. It affects 7,500 babies, children and young people in England. The Alice Martineau trust funds medical and scientific research aimed at understanding, treating and curing Cystic Fibrosis, as well as providing direct financial, practical and emotional support to families and individuals who suffer from this illness. Over the last 15 years the Community of St John has set up four houses to shelter and look after children salvaged from the harsh streets of Lithuania. Many of the children have fled from upset and abusive homes with no better alternative than a life of crime and desperate poverty. My elder brother James worked there last summer, and I have similar plans for my gap year. James will be running the New York Marathon in aid of this charity. Money raised will go towards enabling the children to start a new life having lived in the houses. We are both looking forward to doing the sail now. We’ve had to put a huge amount of work into making it happen and are looking forward to see whether we reach are targets. I’d like to make a big thank you to Laser for the provision of the boats. We are both looking so forward to the sail and the prospect of raising £10,000 for RYA Sailability. I’d also like to thank Finisterre who have sponsored us a fleece each. We will be wearing these after our sail when we land on the beach. They were very supportive of the sail. We’d also like to thank P&O ferries who have sponsored us free tickets for the boats and us for the ferry on the way back. The harrow association have sponsored us £200 to go towards the price of the Pilot and channel swimming Federation, who will be accompanying us across. 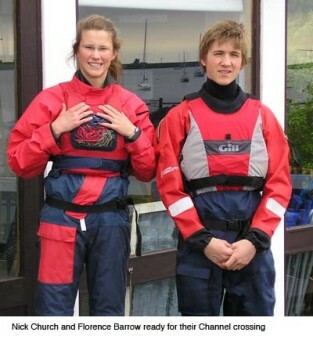 If you would like to sponsor our sail, please do visit our webpage www.justgiving.com/nicandflo.